The City of Melbourne welcomed their first Management Consulting group from the University of Melbourne in year-end 2016. When the City of Melbourne discovered the Management Consulting program, they jumped at the opportunity to work with our students, seeing the mutual benefits that the in-company, intensive subject could provide to both parties. During their time there, Bachelor of Commerce students, Adil Aslam, Christopher Li-Wei Edwards, Carrie Yangluan Luo and Jeffrey Tam made suggestions to streamline the City of Melbourne's staff induction process to make it more efficient and productive, as well as more engaging for the attendees. Their recommendations included replacing tedious training sessions with three 45-minute activities - locating resources, increasing emotional intelligence, and an overview of training courses available at the City of Melbourne. We asked Jim Thomson, City of Melbourne's Internal Communications Advisor, to share his thoughts on having Faculty of Business and Economics student consultants working alongside his team and how he felt they fared. Why did you decide to host University of Melbourne students, and what has the overall experience been like? Were there any challenges and/or pleasant surprises? City of Melbourne has always had a work experience program in place. However, when we learnt about the University of Melbourne’s management consulting subject, we were very impressed by how professionally run it is, and could see that it synergises with our programs really well to benefit both our team as well as the students. We decided we would give it a go, and took on our first group of in-company student consultants. Our challenge was in fact over-thinking which problem or project a student group could work on within the timeframes. However, we needn’t have worried - we were happily surprised at just how advanced these undergraduate students were with their ability to consult, research and engage all stakeholders on the project. They also showed a lot of initiative, and so were fairly self-managed. The end result was a program that our management team agreed was excellent. This made us realise that no problem would be too small or too large for the University of Melbourne's Bachelor of Commerce students. What does a regular day look like for a student on the consulting project compared to a junior staff member? For the most part, students are focused on one project, whereas junior staff have broader roles. A student’s day generally starts with a team catch-up on the brief. Throughout the day, they would speak to any number of key partners and internal stakeholders, either in more formal meetings or over the phone. They would then work on drawing up solutions in another meeting each afternoon. This particular project was to renew the corporate induction program for new employees coming into the City of Melbourne. 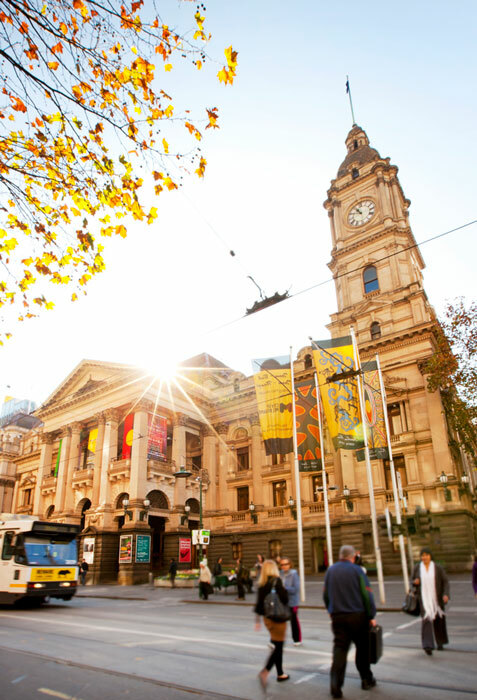 City of Melbourne has evolved throughout the years and although we have embraced our vision internally, this is not necessarily evident to new starters when they arrive. Our corporate induction process has been unchanged for many years and through feedback we are aware it is out-dated, and does not match the City of Melbourne of today! You’ve probably dealt with a number of professional consultants in your career. Tell us your (or the wider team’s) thoughts on how the student group conducted themselves during their time at your workplace and the consulting process they went through? The students brought a renewed spirit to the office with their fresh eyes and new understanding of first, the problem at hand, as well as the purpose of the project. They also saw how important it was to bring people together in a simple and refreshing way, and offered suggestions on how the City of Melbourne could adopt methods to bring this into our culture. Their work may not have changed the world, but it definitely got us thinking smarter and simpler in our renewed approach. We will be implementing at least 80 per cent of the group’s recommendations. In addition, the management team felt the students matched any paid worker that we could have employed. In fact, looking back, in some cases, consultants we have engaged have, at times, not understood the brief as well as the students have. Put simply - they were amazing! How does this hands-on experience and exposure to a professional environment at such a large scale benefit the students? There’s nothing like learning by doing and it is great being able to partner with the University of Melbourne to offer students this opportunity. The students are exposed to a range of professional situations, and develop inter-personal and time-management skills, for example, how to work with conflicting schedules, or even how to hold brief meetings that get the best out of all involved – it may not seem much, but these are important workplace skills. They also learn about organisational culture and get a feel for what it is like to present real reports to management – things that may be daunting for graduates entering the workforce for the first time. Finally, please tell us your general thoughts about the subject and whether you would recommend the program to other organisations. I would definitely recommend the subject. I believe that both student and organisation truly benefit from having programs such as this incorporated into work experience plans. Students gain real-life, problem-solving skills and the organisation not only saves on potential consultancy fees, but also gain a potential new valued employee. I see the Management Consulting subject as providing valuable introduction into up-and-coming talent, and the City Of Melbourne looks forward to hosting future University of Melbourne student consultants.